Insurance companies are reluctant to divulge their secrets, but organizations ranging from Consumer Reports to Money Geek have analyzed premiums and insurance company practices from state to state and come up with some surprising answers. It may seem inevitable that adding your teen to your auto insurance policy will cost a fortune, but there are a few ways to keep the cost as low as possible . Knowing the facts will help you make the wisest financial decisions when adding your teen to your car insurance. Usage-based auto insurance (UBI) uses telematics (also called “black boxes”) to track driving metrics. Progressive and GMAC pioneered this method to determine who is a good driver in 2008. The National Association of Insurance Commissioners (NAIC) estimates that 70% of auto insurance companies will be offering Pay-As-You-Drive (PAYD), Pay-How-You-Drive (PHYD) and similar premium programs. 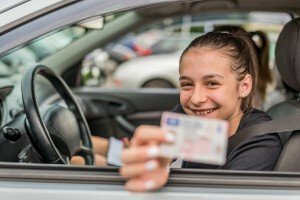 If your teen is a safe, responsible driver, this kind of auto insurance can save you hundreds of dollars in premiums a year. Discounts vary using systems like Allstate’s Drivewise and State Farm’s UBI program. Allstate’s program will provide a premium discount up to 30% which varies depending on driving habits. The good student discount many insurance companies offer can reduce premiums anywhere from 10% to 30%. A new trend called “InsurTech” incorporates data about student grades, interests, and even after-school participation. The influence of “InsurTech” big data on insurance premiums is still emerging. For now, if your teen has a B or above grade point average, they are likely to qualify for a good student discount. College students must be enrolled half-time to receive a good college student discount. Used minivans or small SUVs, including cars like the Honda Odyssey or Jeep Patriot, routinely top the list of lowest insurance rates. Many of them are on the road, they use commonly-available parts, and they are often used for errands around town. Used cars are almost always more affordable to insure than new cars. If you do buy a new car , keep it for yourself and give your teen the older car in the household. Your teen may resist driving a “mom van,” but the time-honored tradition of passing an older car on to teens as a first car is a money-saver. Don’t neglect to tell your insurance company if your teen is going away to college without a car. Many students attend college at urban universities or in rural settings where everything is available on campus. The majority of insurance companies offer “distant driver” or college driver discounts. Pay only when your teen is home and driving. In 2015, Consumer Reports’ in-depth survey of more than 2 billion insurance price quotes showed differences of thousands of dollars for large national insurance companies between different states, different customer driving records, and even credit scores. The survey busted some myths, such as customer loyalty discounts. Many insurers charge long-time customers more than new customers, Consumer Reports found. Auto insurers also use a specialized credit score to determine rates. Only California and Massachusetts prohibit insurance companies from using credit scores to determine premiums, so if you and your teen live in one of the other 48 states, getting several different quotes is a must. You may be surprised at the answer you receive.